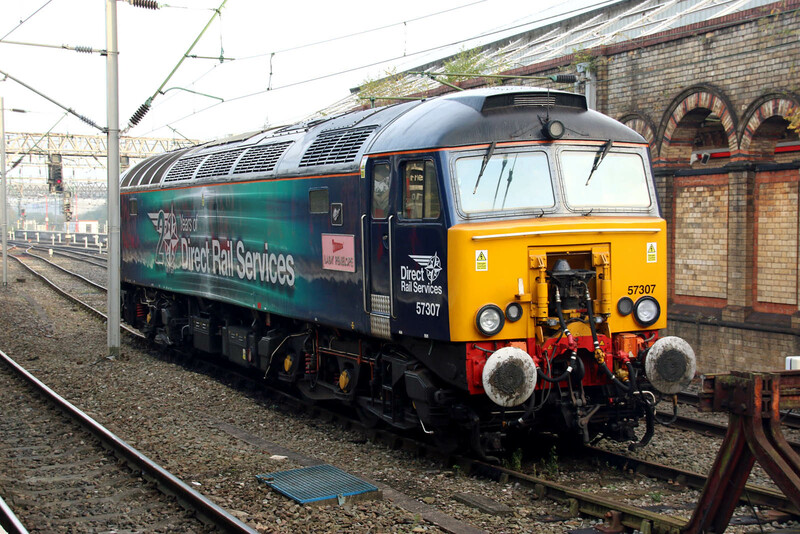 57307 Lady Penelope marked for '20 Years of Direct Rail Services' as a Thunderbird standby. Originally D1901 delivered from Brush in September 1965, later 47225 which operated for Freightliner. Rebuild to 57307 completed in September 2003. 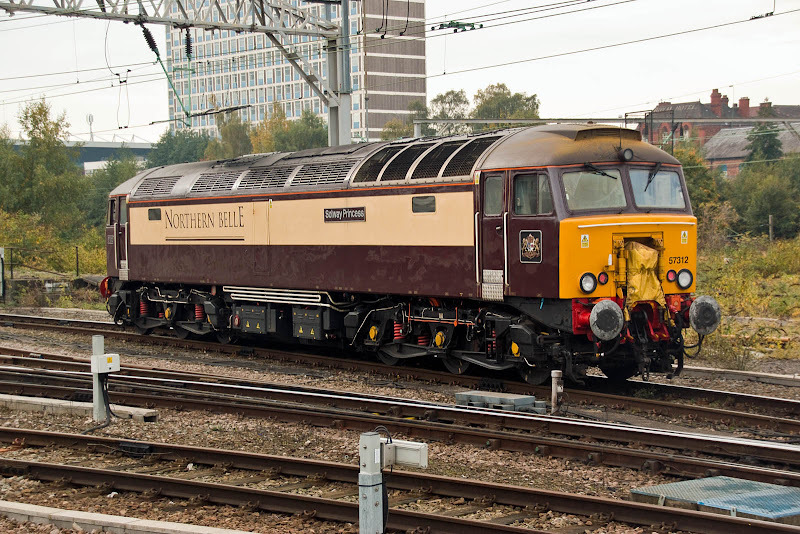 57312 Solway Princess was seen shffling around the station a couple of times. New as D1811 from Brush, Loughborough in February 1965. 47330 from April 1974, 47390 for a while in 1994-5. Out of service from June 2000, and readied for 57/3 conversion in June 2003, emerging in October as 57312 The Hood. Suffered a near withdrawal experience in early 2013. 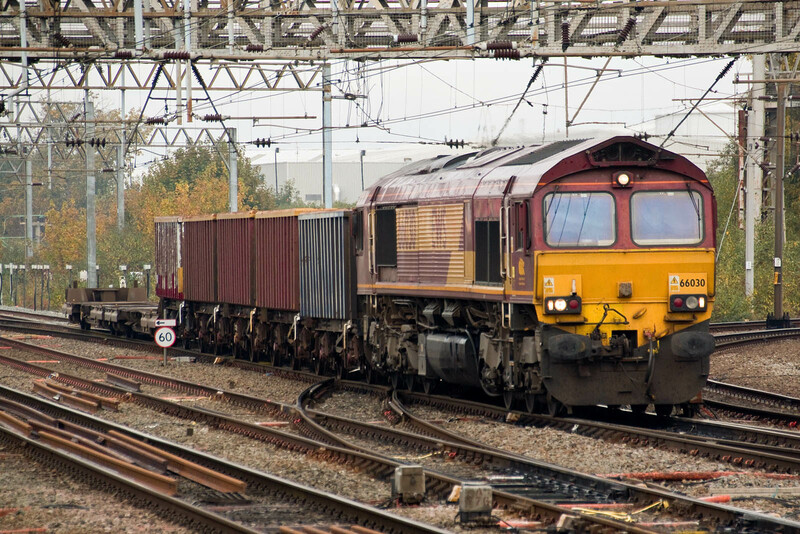 66030 arrives from the north with the regular Friday 6K32 wagon repair turn from Warrington Arpley (10:53) to Marcroft at Stoke (now Axiom Rail). 37069 + 37604 arrived and reversed in the Platform 8 to access Gresty Bridge DRS depot. 37069 was new from English Electric Robert Stephenson & Hawthorns (Darlington) as D6769 in July 1962. 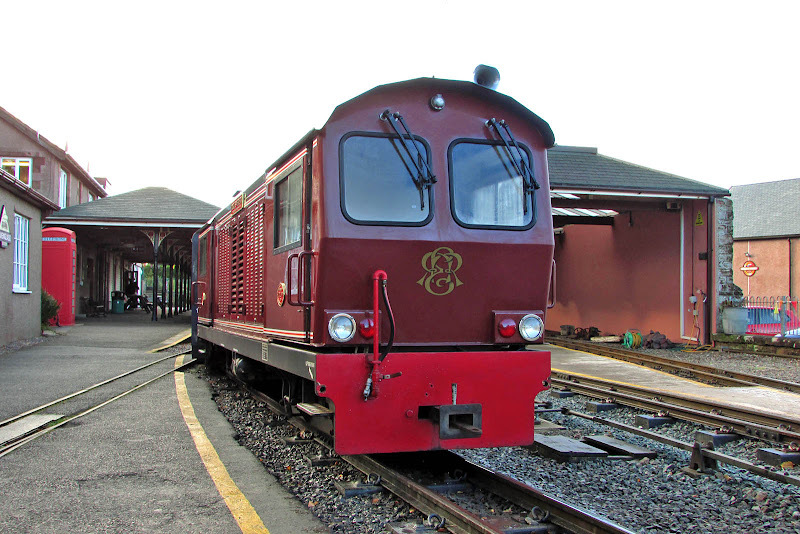 Renumbered as 37069 in July 1974. 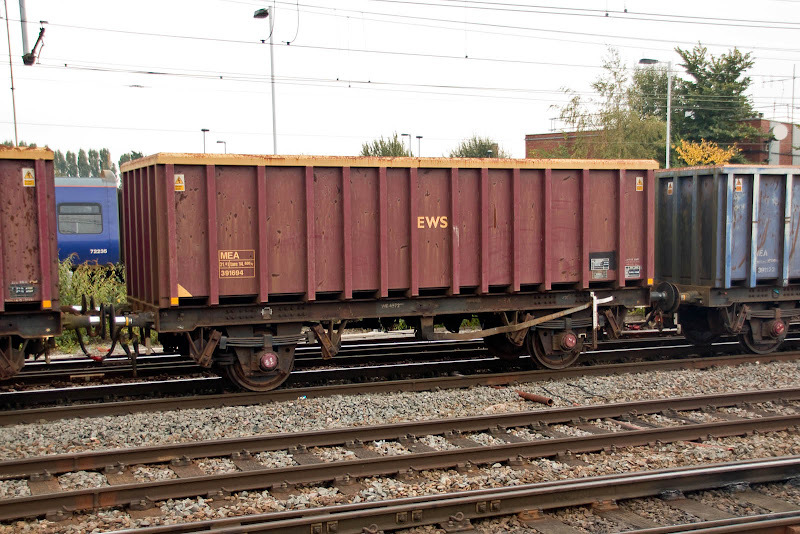 Sent to France in July 1999, returning in October 2000 and stored WNXX at Wigan CRDC. 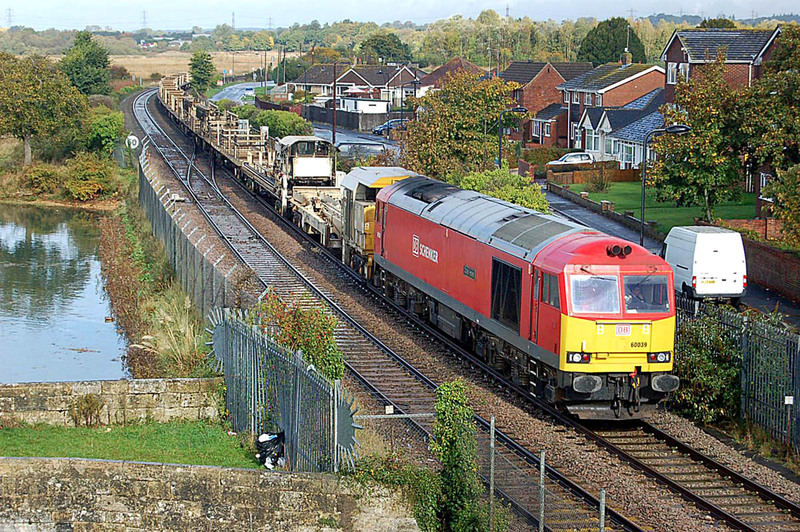 Selected for overhaul at Brush for DRS, arriving at Loughborough in February 2002, released to traffic in August 2003. Stored in May 2012, overhauled at RVEL Derby from July 2015, returning to traffic in October of that year, allocated to pool for XHNC nuclear traffic. 37604 was new from English Electric Vulcan Foundry (Newton le Willows) as D6707, allocated to March, on 3rd February 1961. Renumbered 37007 in February 1974. Heavy General Overhaul at Crewe October 1985 - April 1986, emerging as 37506. 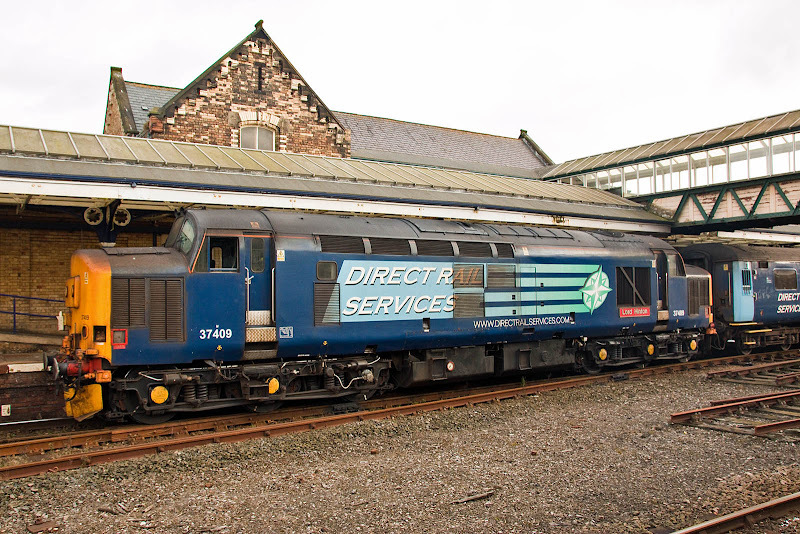 Renumbered 37604 for European Passenger Services in April 1995, transferred to DRS in October 2007 and currently allocated to pool XHNC. 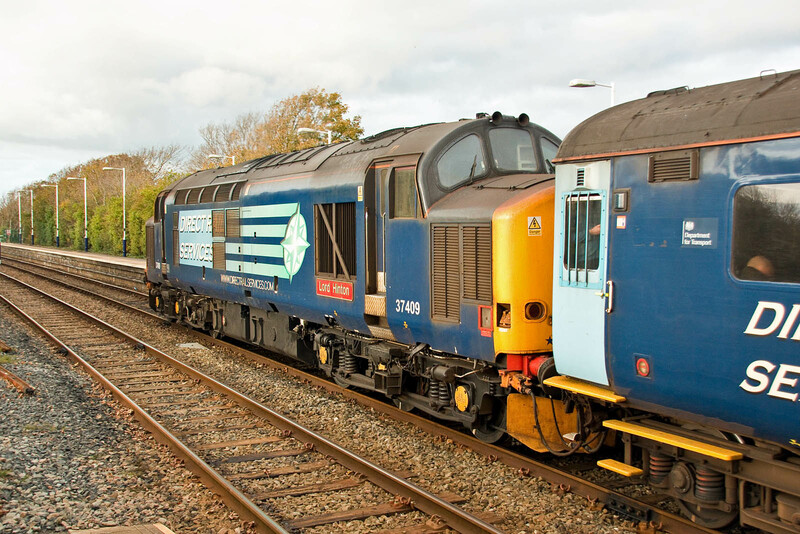 At a recent 6592 engine hours, this is one of the lower time Class 37s in the DRS fleet. 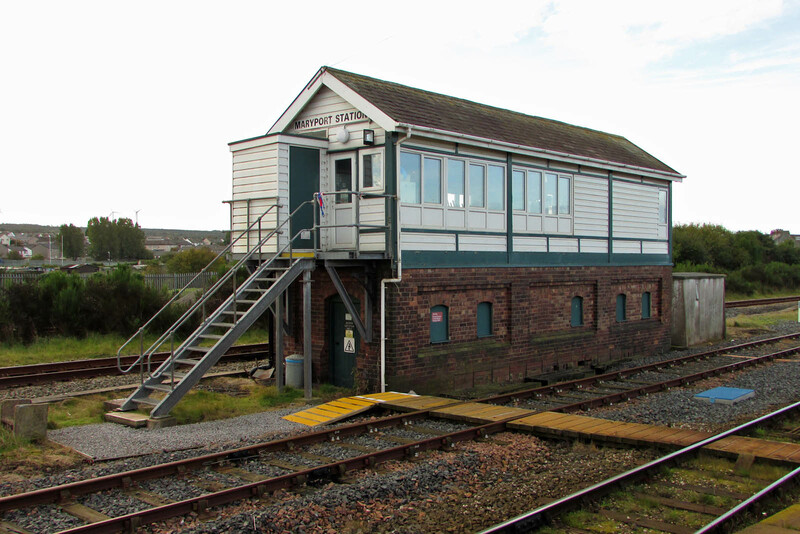 Maryport Station signalbox was built in 1933 as an LMS Type 11b+ with 50 levers. 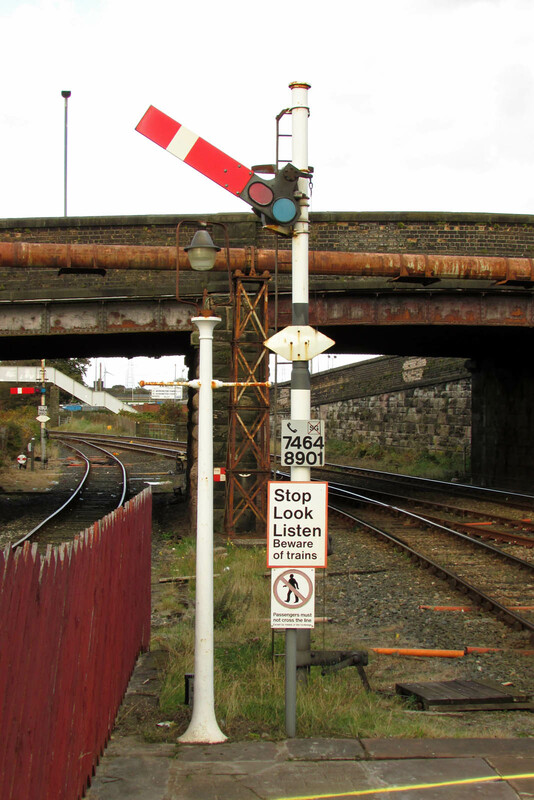 Working is absolute block, but signals are all colour light. 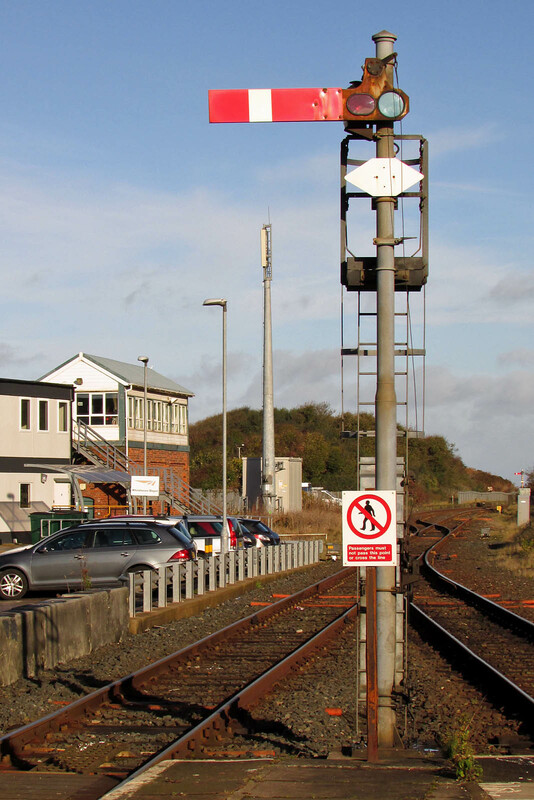 Maryport Station is of unusual layout, as all passenger trains call at a single platform. The layout looking towards Workington. A full set is available on OneDrive. 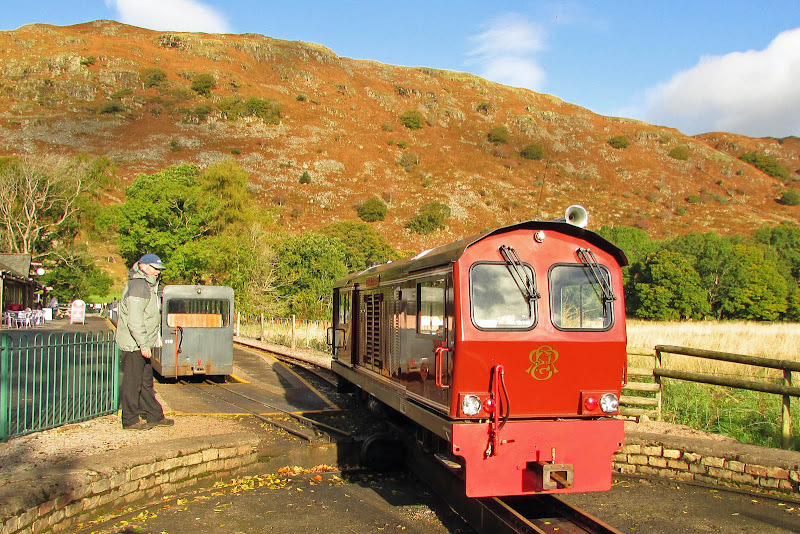 ICL11 Dougls Ferreira (TMA Engineering 2005) is seen at Ravenglass, ready for the first timetabled train of the morning. 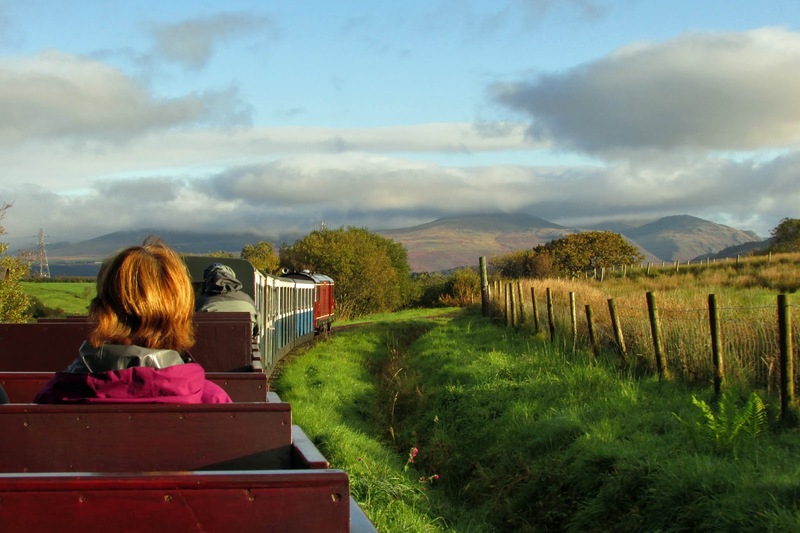 Heading out in the first mile from Ravenglass. The hills in middle background are on the north side of Wast Water. Only three passengers and one dog at this point. 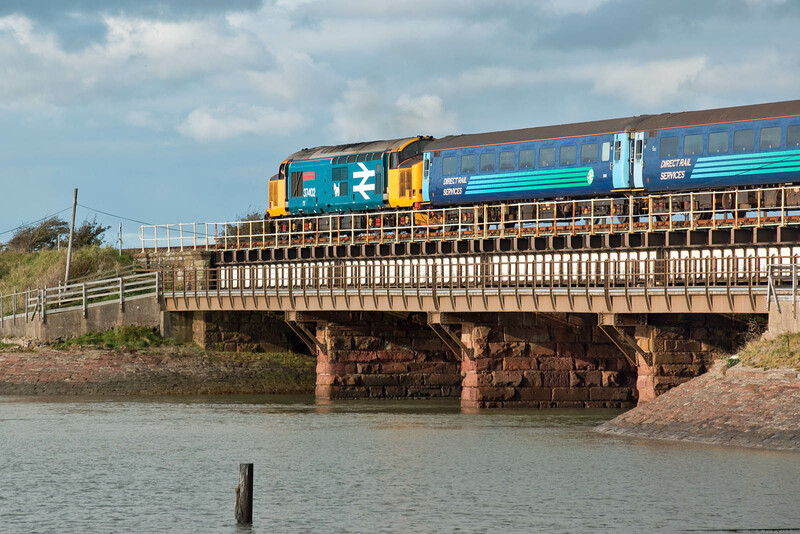 River Irt was on the second train, seen passing at Beckfoot. 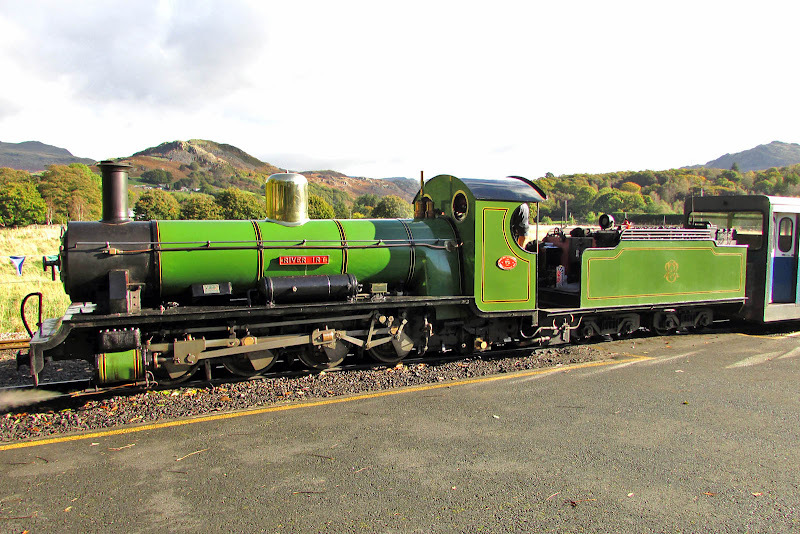 River Irt running around at Dalegarth. 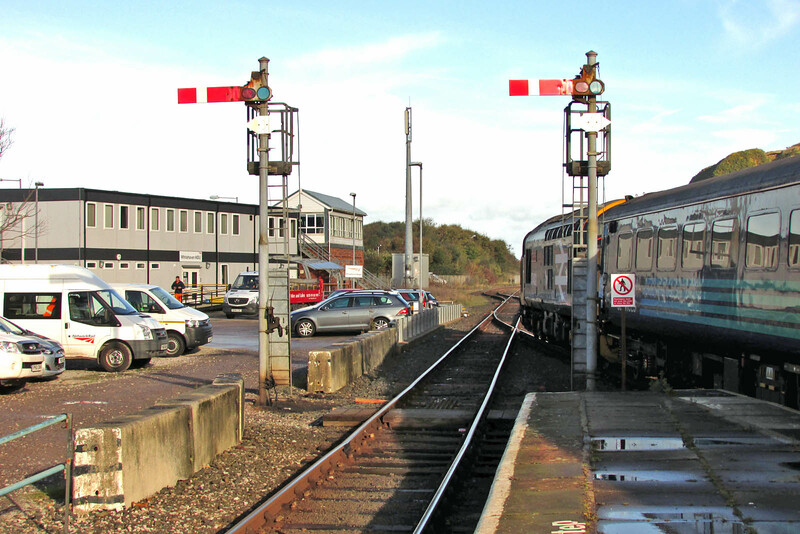 New book 'Hampshire Traction' - many pictures at locations familiar to readers of this website, the print quality is however rather below the normal for this publisher. 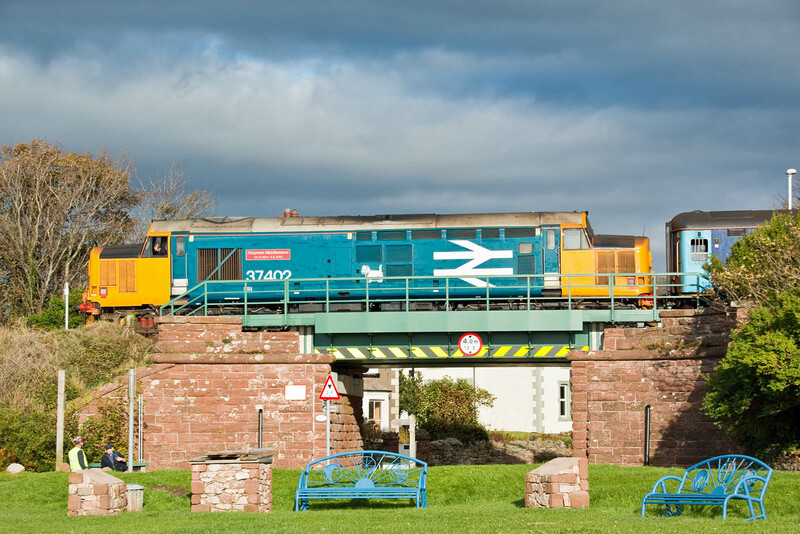 37402 departs Ravenglass with 2C41 14:37 Barrow - Carlisle. 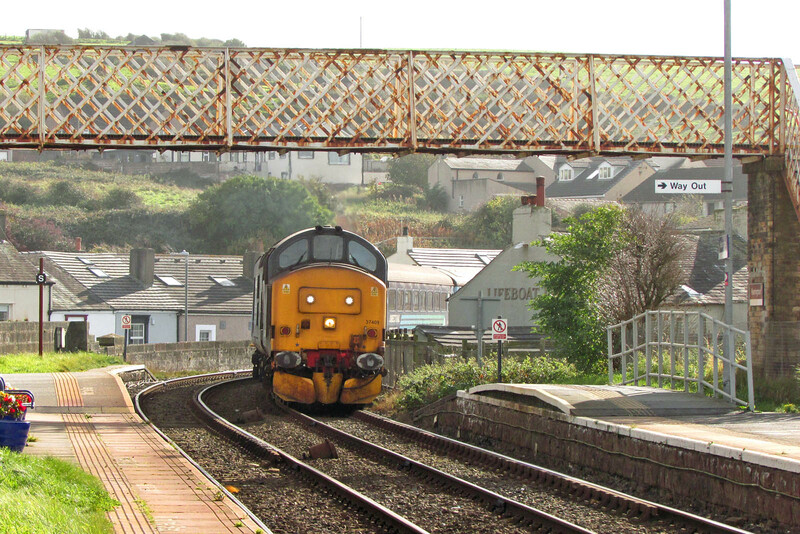 Proceeding over the viaduct over the River Mite. 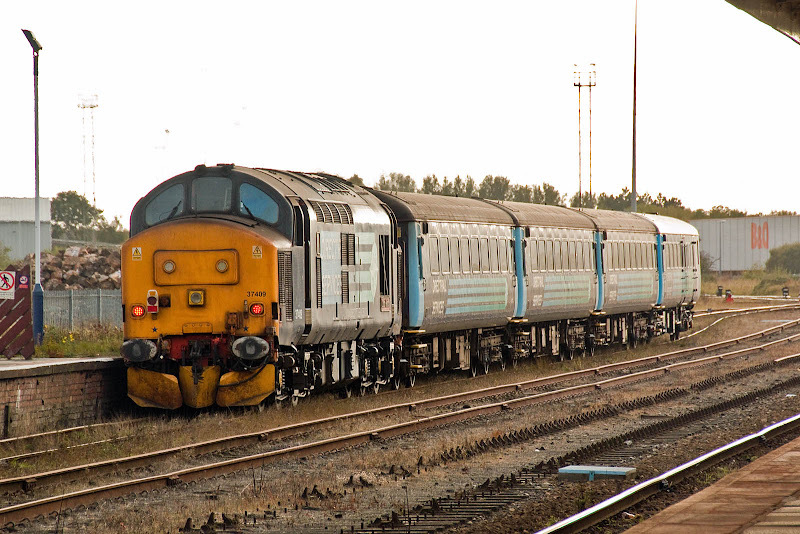 37409 on the rear of 2C34 14:35 Carlisle - Barrow. The locomotive had replaced 37403 at Carlisle. 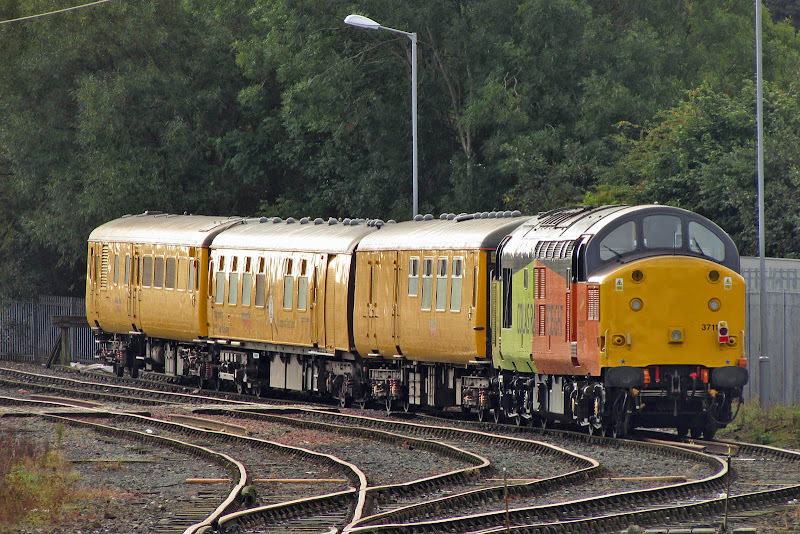 37116 with a parked test train. 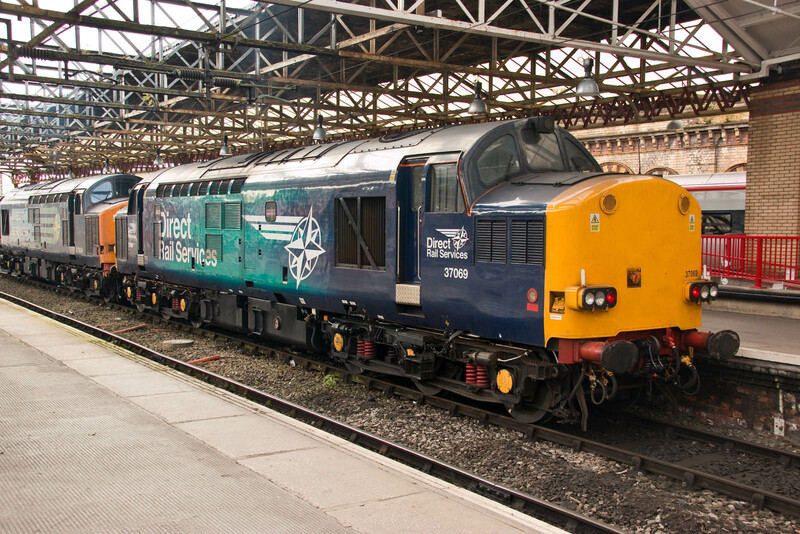 The centre coach was Ultrasonic Test Coach 999606, formerly 62356 from from 4-CIG 1850. The DBSO was 9714. 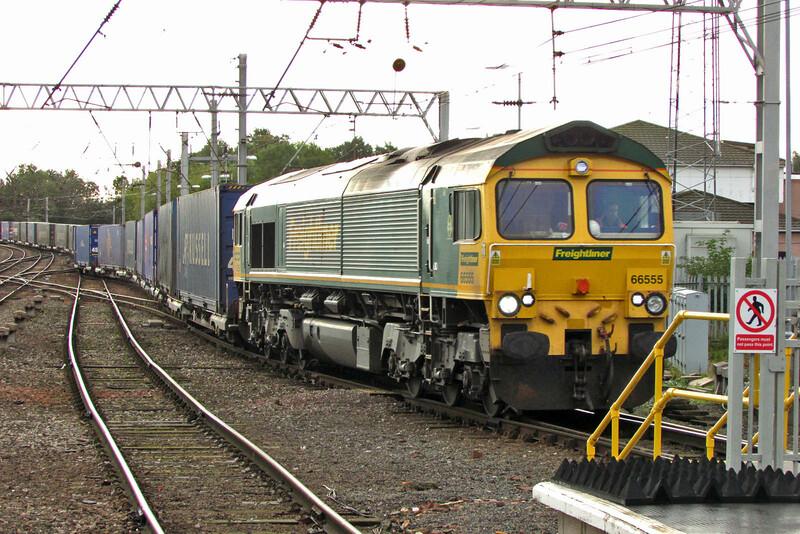 66555 with an STP 05:06 Daventry-Coatbridge. 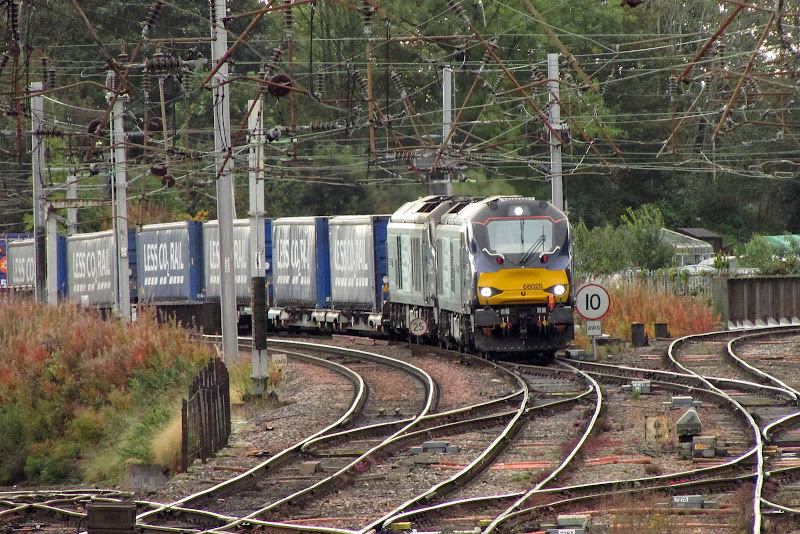 68025 Superb + 68023 Achilles arrive with the 'Tesco Express' 4S43 0616 Daventry-Mossend. 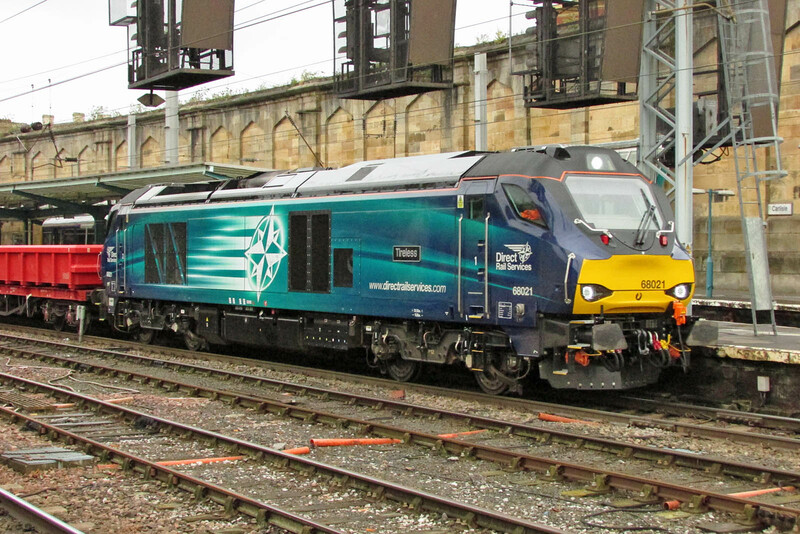 68021 Tireless with 1042 Carlisle New Yard - Crewe Basford Hall formed of MXA wagons. 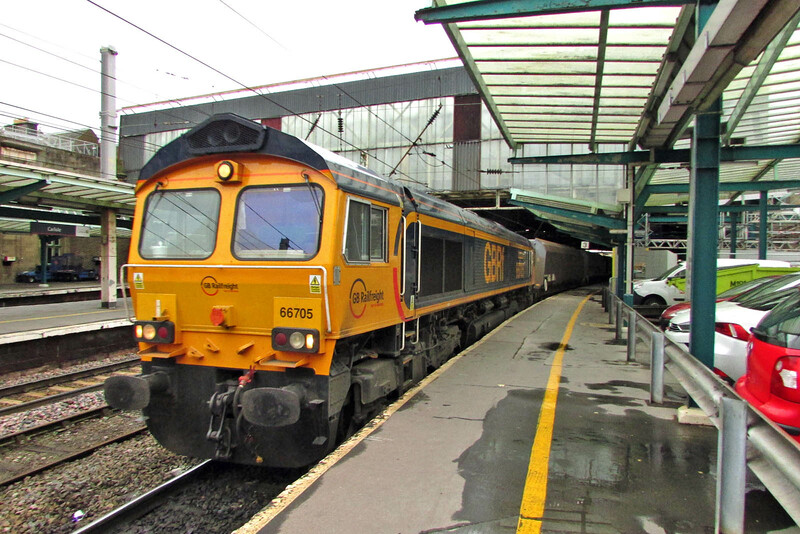 66705 Golden Jubilee with rarer coal working - empties 4S05 06:14 Doncaster - Killoch. which worked via Newcastle area. 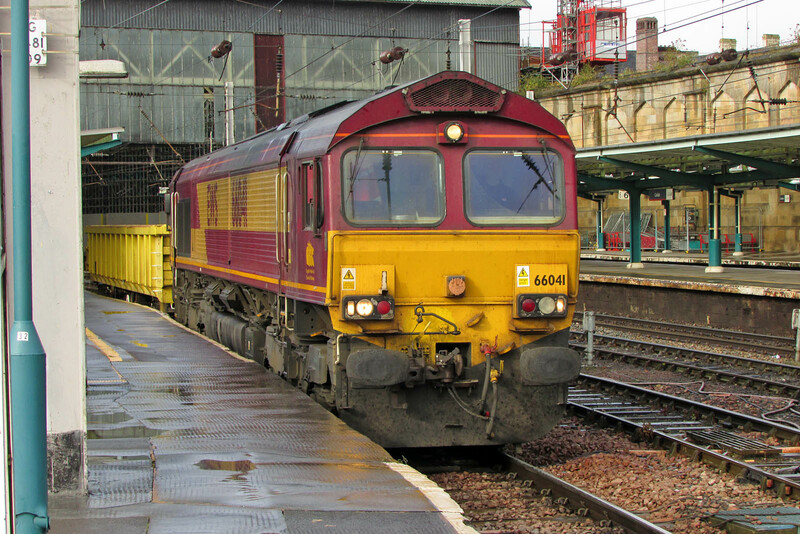 66041 with a single wagon 1348 Carlisle New Yard - Tyne. 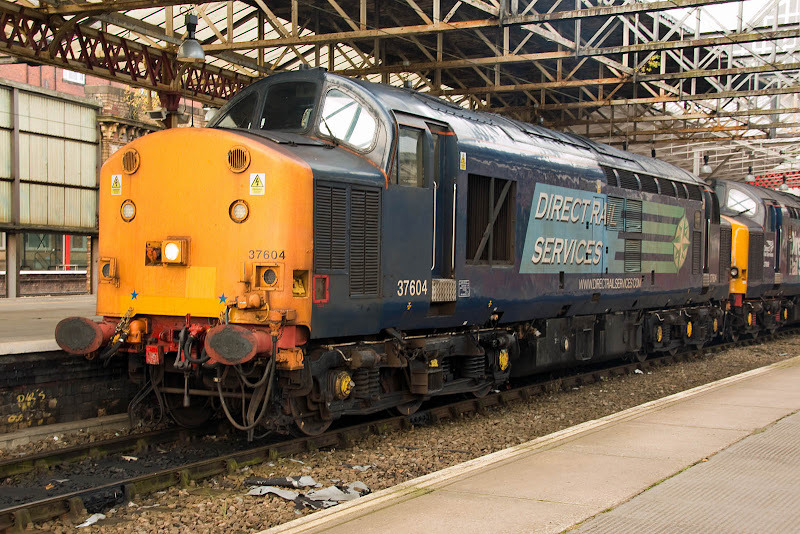 37402 arrives at Carlisle from the Maryport line with 2C49 11:38 Barrow - Carlisle. 37116 (new as D6816 in March 1963) is parked to the right with a test train. 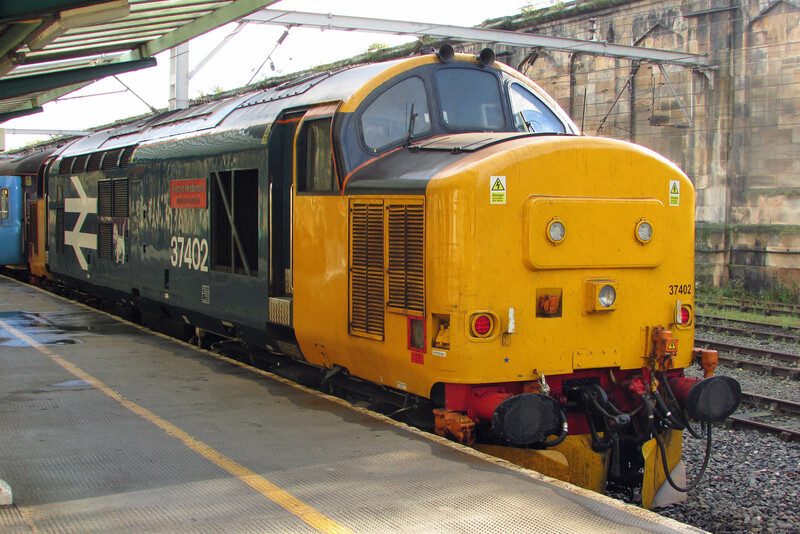 37402 in the turnaround at Carlisle. 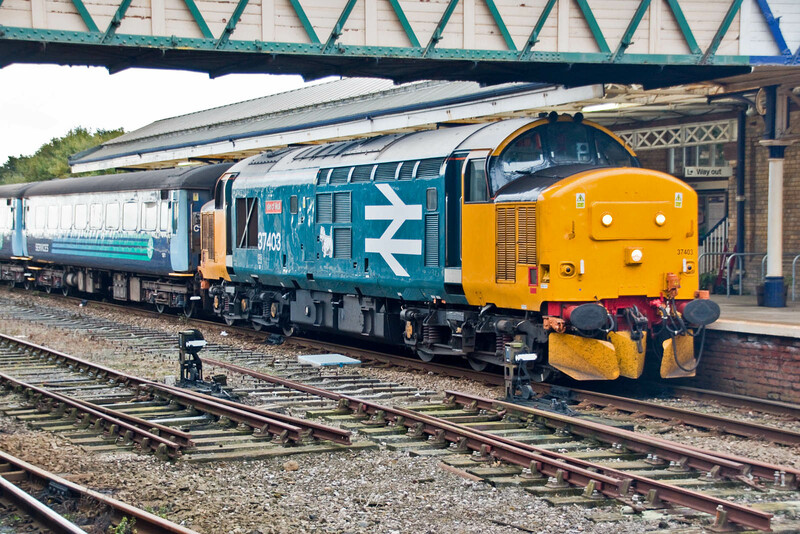 The locomotive was new as D6974 in April 1965, later 37274 and rebuilt to 37402 at Crewe in October 1984 - July 1985. 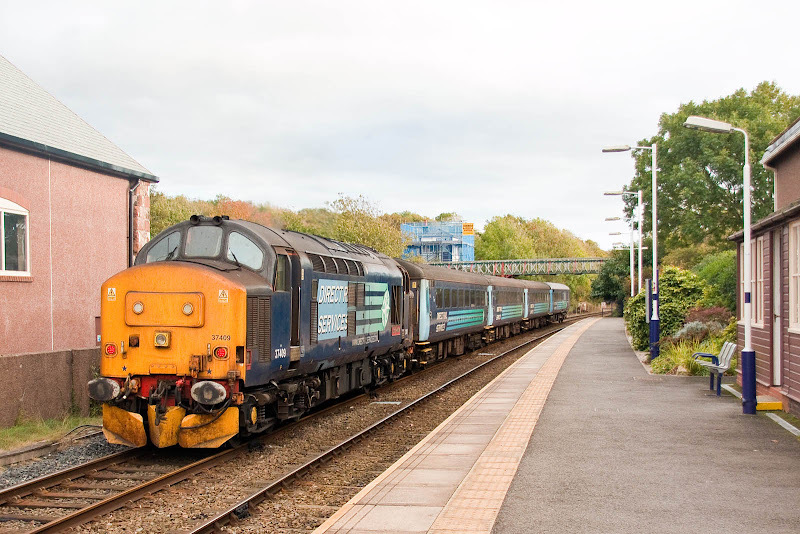 On hire from the SRPS Diesel Group, 37403 Isle of Mull is arriving at Workington with 2C41 14:37 Barrow - Carlisle. 37403 was new as D6607 in October 1965, later being renumbered to 37308 and rebuilt to 37403 between October 1984 and June 1985. 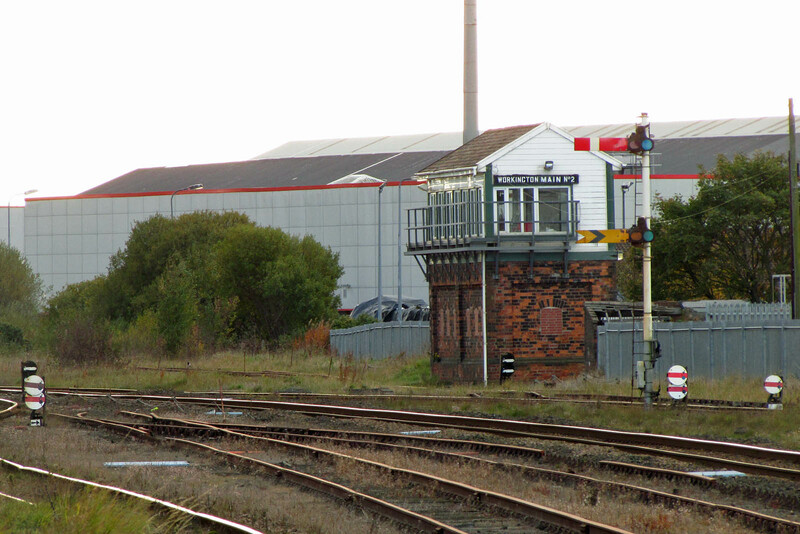 The signalboxes are of LNWR origin, which followed the acquisition of the Cockermouth and Workington Railway and Whitehaven Junction Railway in 1866. 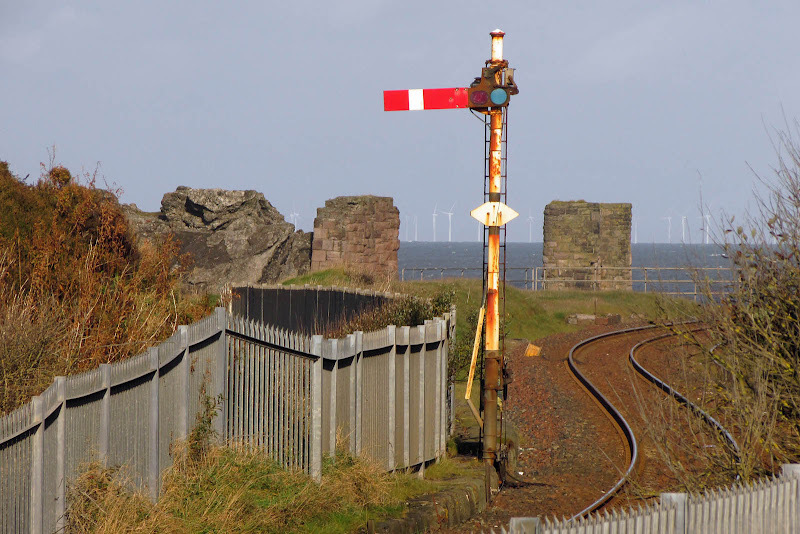 Signalling between Whitehaven and Wigton is absolute block. These pictures were taken between 16th and 18th October 2016. 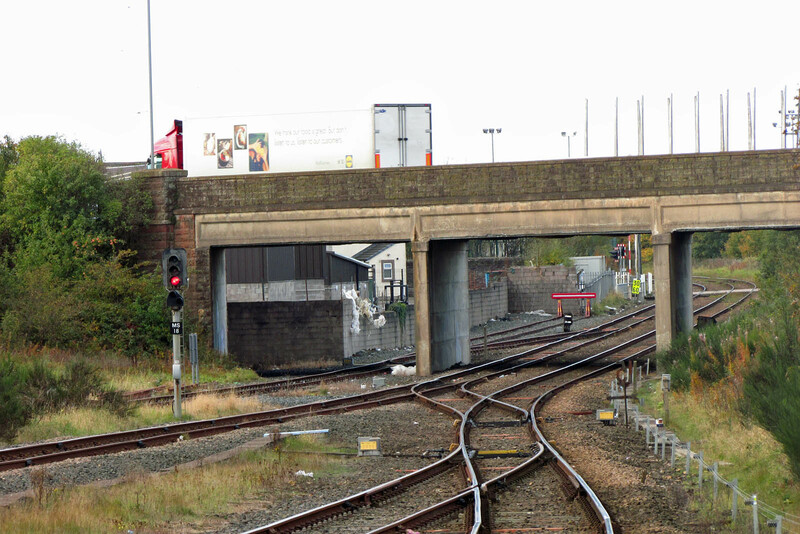 Workington Main No. 2 stands to the south of the station. 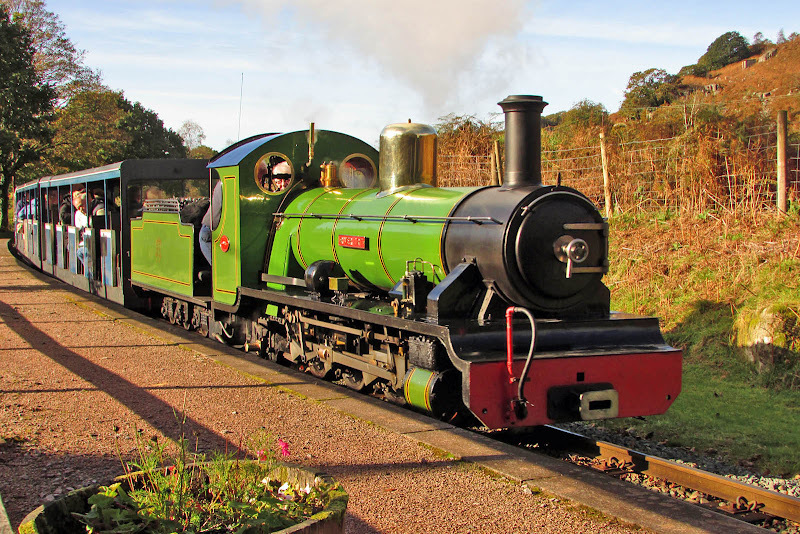 It is an LNWR Type 4 box, built in 1886, now with 58 levers. 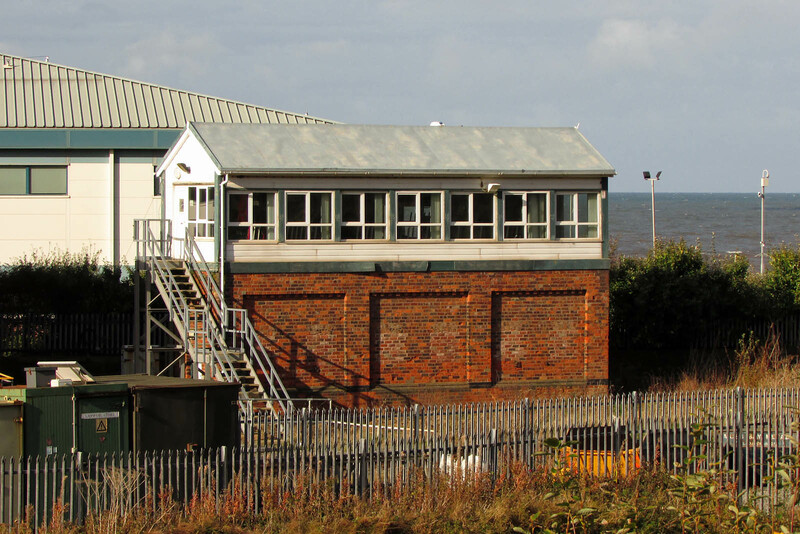 This signalbox controls a mixture of semaphore and colour light signals, the sempahore signals on the right (WM2 8) being for the reception siding at the yard (or what remains of it, as the British Steel facility is being demolished) at the back of the station. 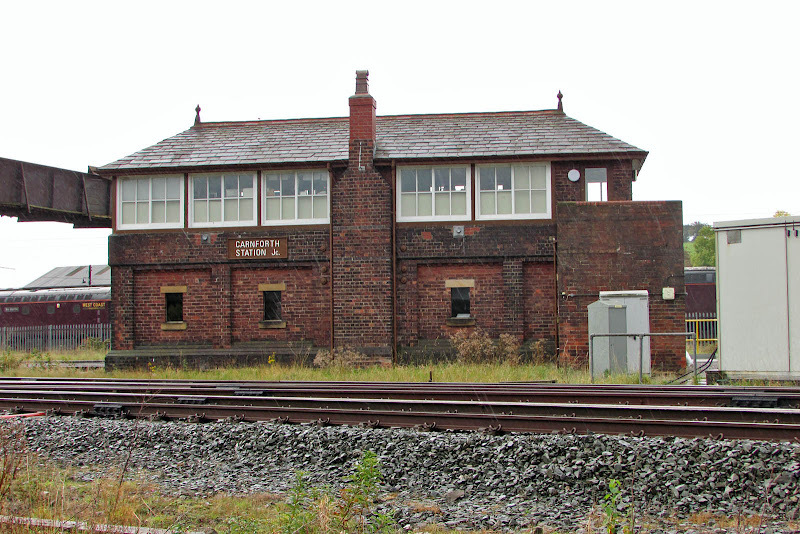 There was once an adjacent engine shed, of which the base can still be seen, after the structure was removed to storage at Swithland on the Great Central Railway. The up starter signal at station platform end is a colour light (WM2 5). Opening hours are 05:30 - 00:00 Mon - Sat and 12:00 - 23:40 Sun. Diagram. 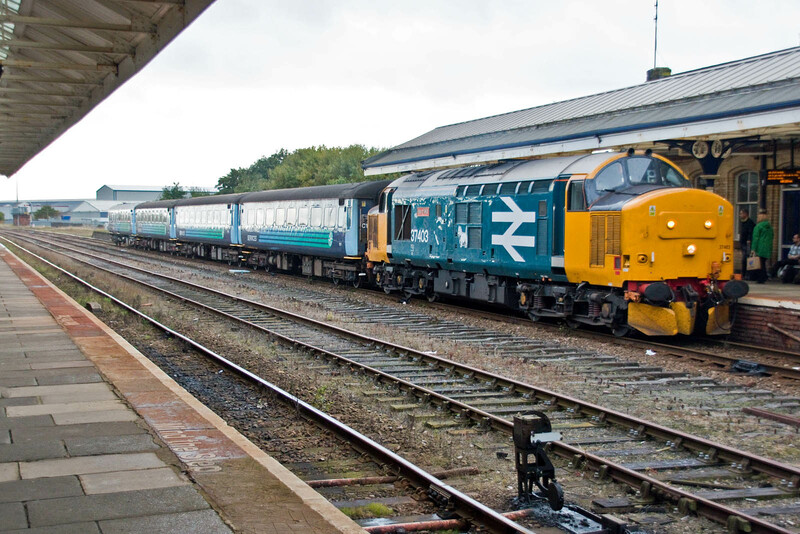 Workington Main No. 3 is open 07:00-23:00 Mon-Fri and 07:00-15:00 Sat, otherwise is switched out - both boxes can be switched out. This box is a LNWR Type 4+ built in 1886, and now has 25 levers, at one time having 55. 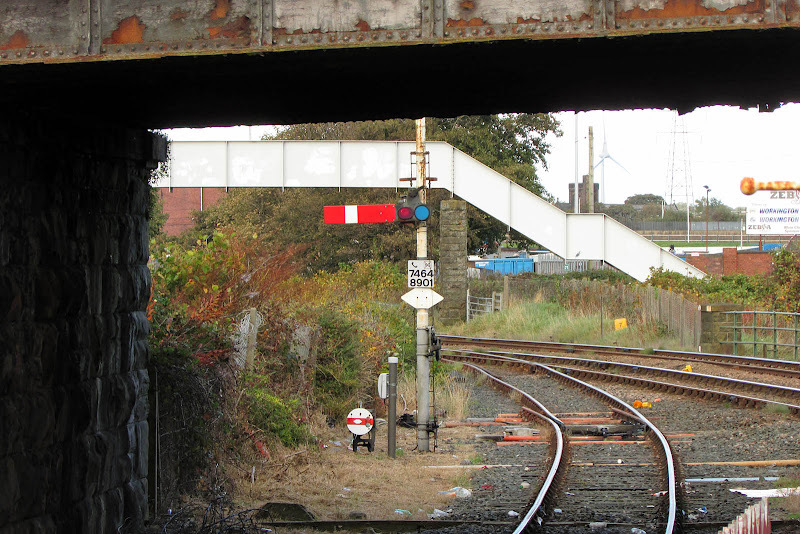 On the Maryport side, it controls access to the ground frame to the docks and industrial sidings. 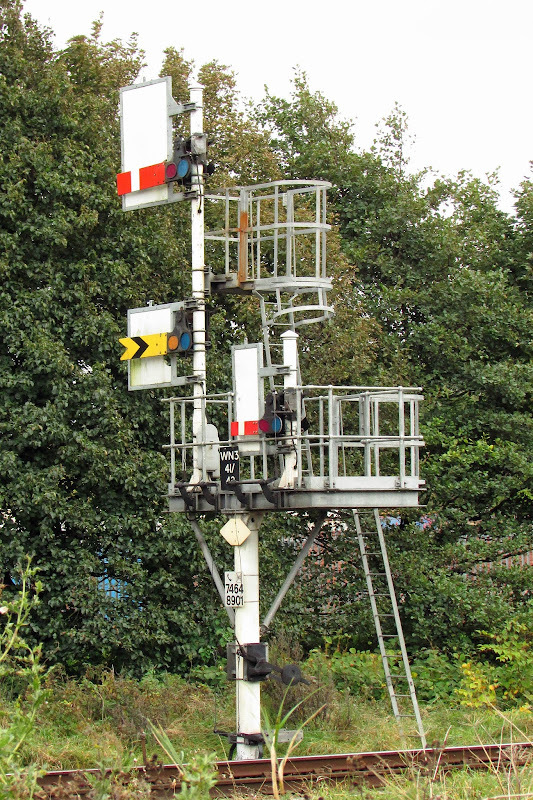 The middle sidings are disconnected and partially lifted, yet the disc signals remain. Main No. 3's down starter (signal WM3 23). Diagram. 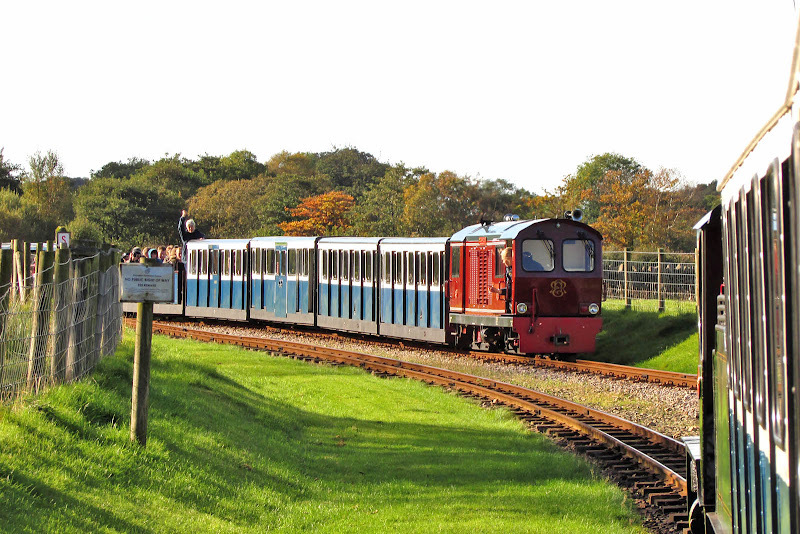 Starter for exit from the reception sidings, looking towards Maryport (signal WM3 21). 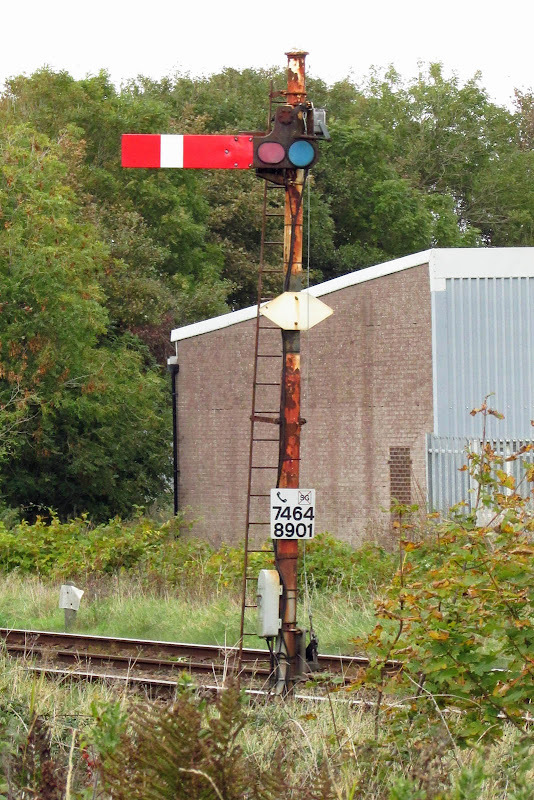 Down home signal WM3 24 to protect the docks branch. 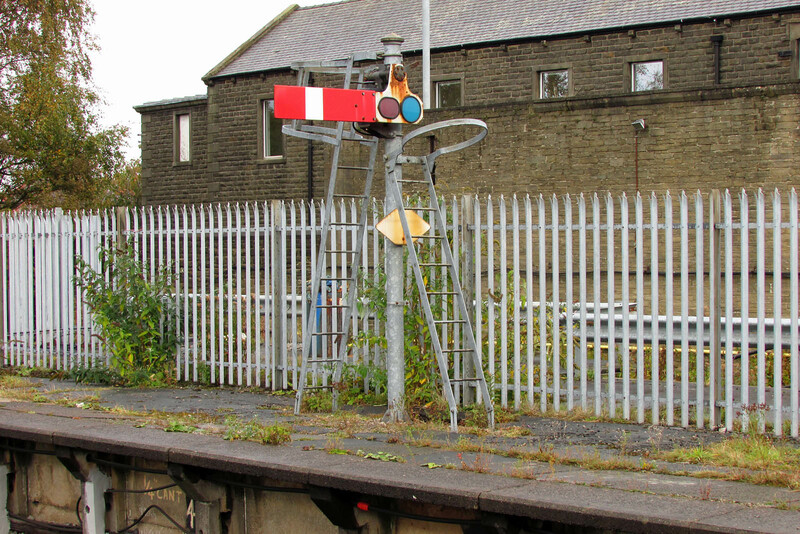 Home signal with distant signal is released by Workington No 2. 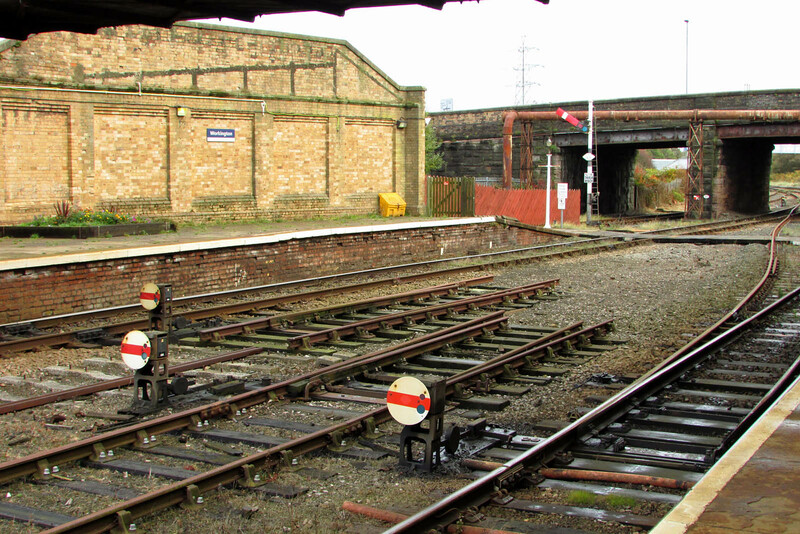 (signal WM3 42) with subsidiary arm to enter the reception siding (signal WM3 41). 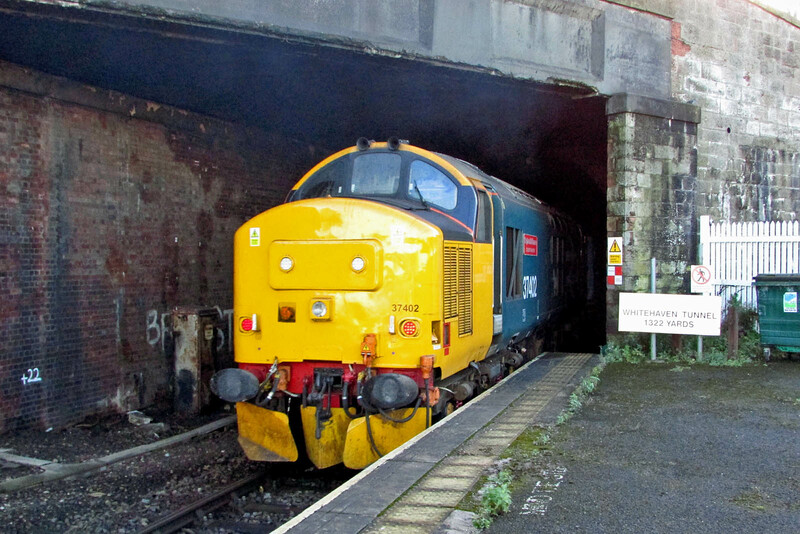 37402 Stephen Middlemore - 23/12/1954 - 8/6/2013 enters the tunnel at Whitehaven Bransty, running with 2C40 08:42 Carlisle - Barrow. 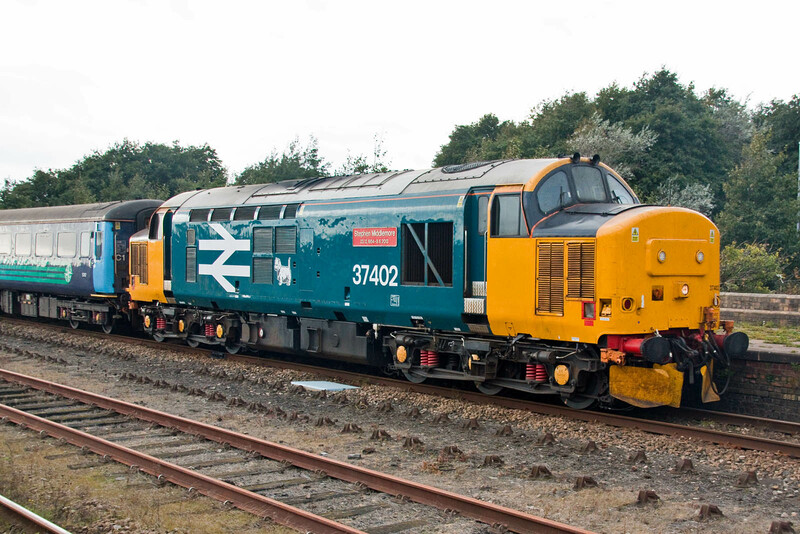 37409 Lord Hinton arriving at Harrington with 2C49 11:38 Barrow - Carlisle (appears to have swapped diagrams at Barrrow). 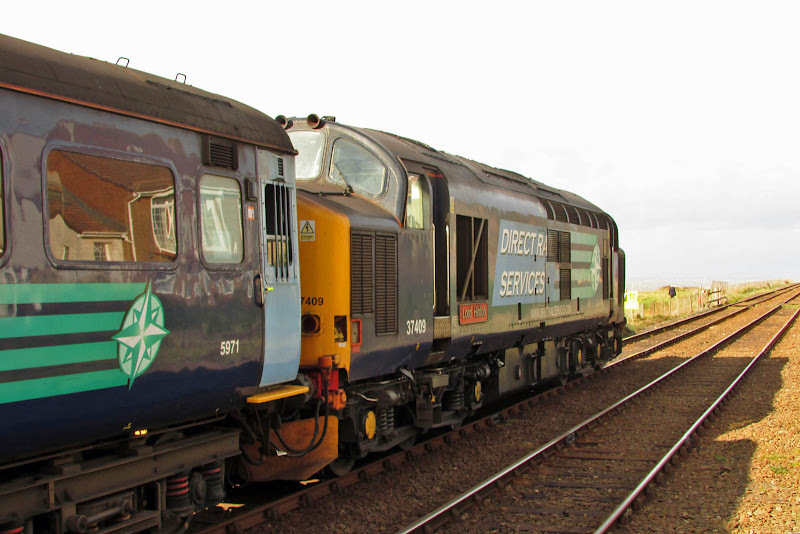 37409 ready to depart from Harrington. 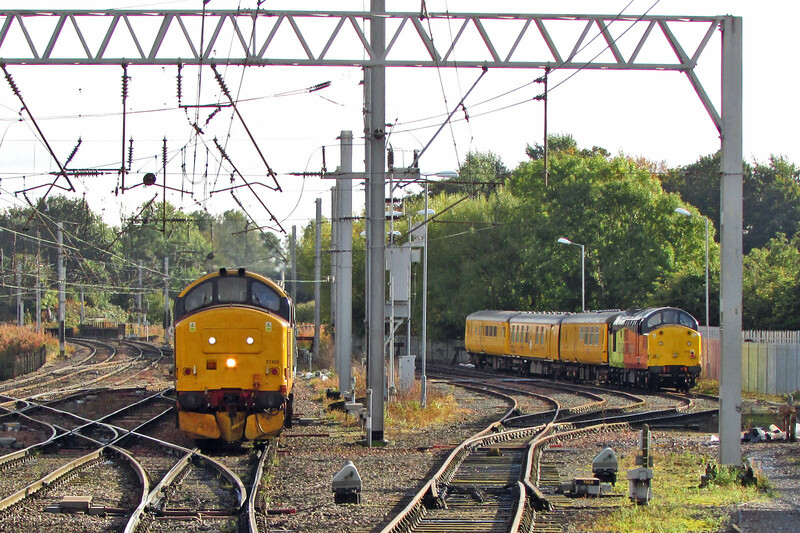 37402 returns north with 2C41 14:37 Barrow - Carlisle. 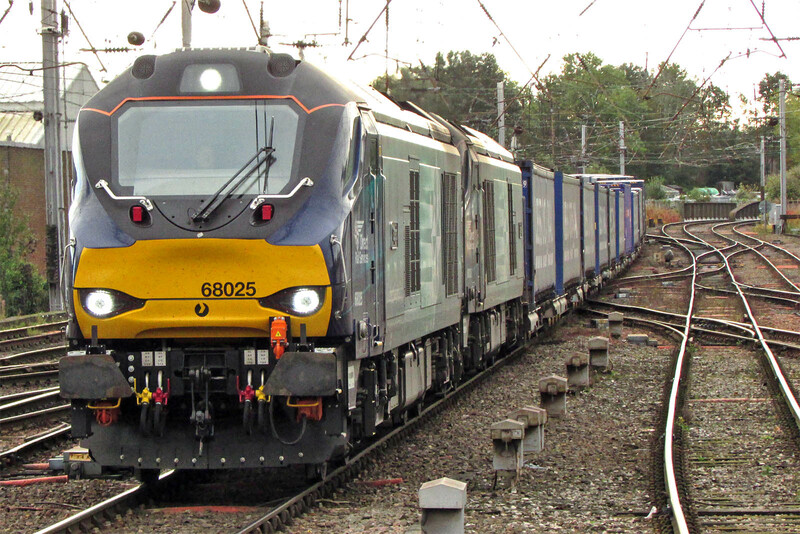 60039 at Redbridge, 17th October. Image by Ian Knight. 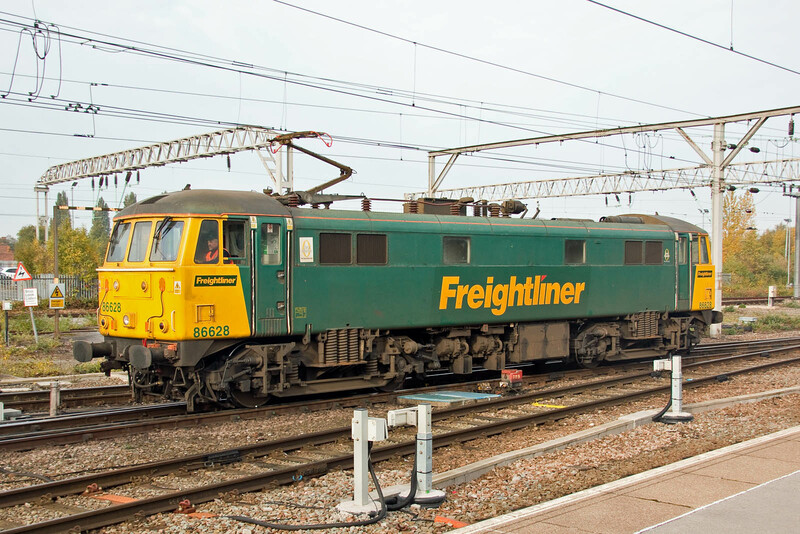 GB Railfreight is being sold by Eurotunnel, with a private equity funded bid received from EQT Infrastructure II of Sweden, who are invested in Hector Rail. 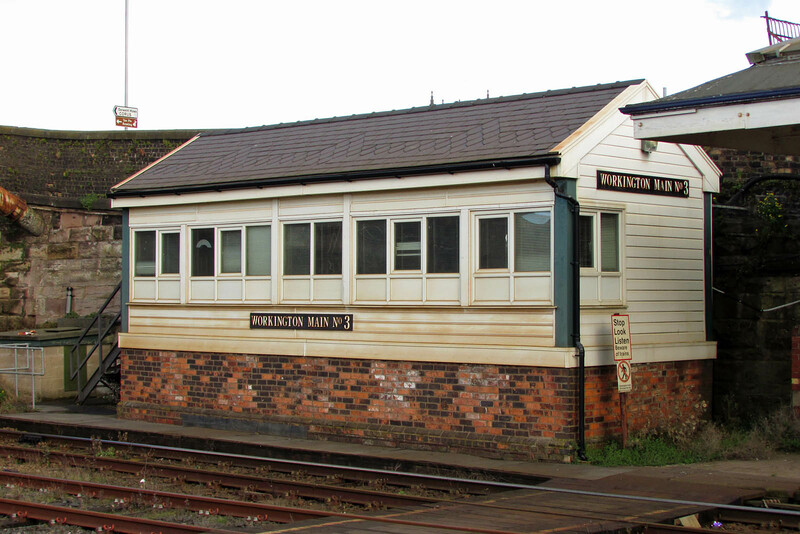 Carnforth Station Junction is the surviving signalbox in use, and interfaces with Preston Panel. 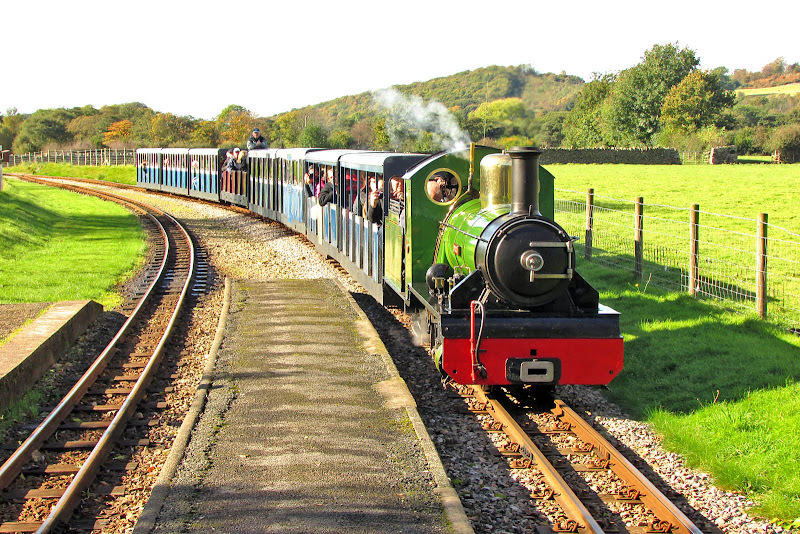 Built to a Furness Railway design, completed in 1903. 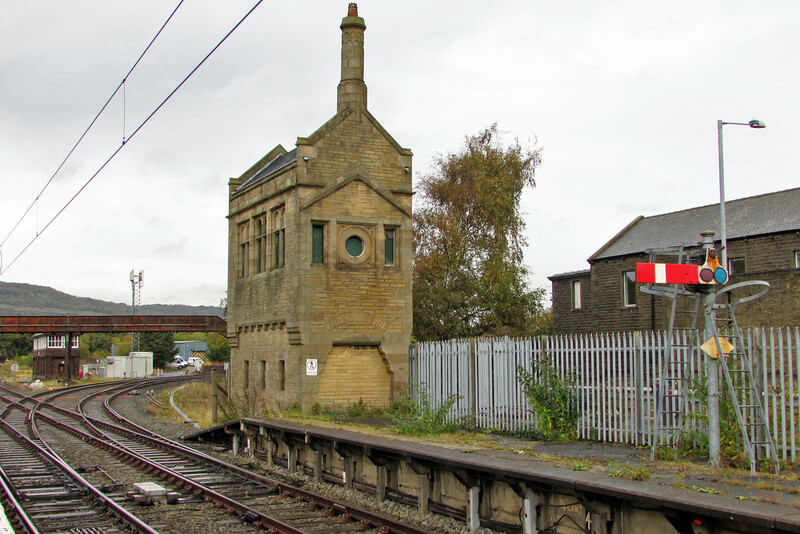 This earlier signalbox of 1882. Fixed stop signal on the up line.